The Day of 7 Billion Humans is here…and we keep counting! When I was born in the mid 1960s, the world’s combined human population was around three and a half billion (having passed the 3 billion mark in 1960). In my life time of 45 years, this number has doubled. We can never pinpoint it exactly, but the world’s demographers have agreed to count 31 October 2011 as the Day of Seven Billion. Sometime today, our human numbers will add up to 7 billion…and keep rising. That’s 7,000,000,000 living and breathing people — all of who will need to be fed, clothed, sheltered and cared for in many other ways. And they will have higher aspirations in the 21st Century than ever before in history. If I was too young to remember the day of 4 billion, which was sometime in 1974, I can well remember the last two billion marks. In 1987 — the year I entered journalism — human numbers passed five billion. A dozen years later, in 1999, the six billion was reached. By then, I too had added my contribution of one co-produced human being (and stopped there). During this year, National Geographic magazine is publishing a 7-part series examining specific challenges and solutions to the issues we face. The magazine introduces the series with its January cover story “7 Billion,” offering a broad overview of demographic trends that got us to today and will impact us all tomorrow. The first in-depth story will appear in the March issue, focusing on humans’ impact on the planet’s geology. Other stories will follow throughout 2011. Correction added by NatGeo editors: in 2050, 70% of the population will be living in “urban areas,” not “megacities” as stated in an earlier version of this video. 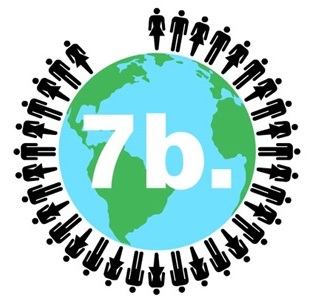 The Face of 7 Billion is another interactive feature on NGS website. Zoom in on this graphic in which the world’s 7 billion population is depicted by 7,000 human figures, each representing a million people. A world party of 7 Billion? In another short video on National Geographic website, Nigel Holmes imagines how much space we would need to host a world party for 7 billion people in 2011. I don’t like the word population: it sounds cold, clinical and detached. Zoologists can talk about ant populations or elephant populations, but when demographers (and others, including journalists) refer to our the counting of species as human population, I somehow feel it’s too impersonal. Aren’t we more than mere numbers? So in my own writing and TV scripts, I use the phrase ‘human numbers’. Can you visualise 7 billion? Semantics apart, our rising numbers are indeed a cause for concern. We didn’t quite see the ‘population bomb’ go off the way we were warned about – thank the secular Force – but we still face formidable challenges. Our planet’s natural systems are over-stretched not only by our sheer numbers, but also by our technologies and consumption. The many signs of planetary stress include accelerated loss of species, fast spreading deserts, and declining air and water quality. To cap it all, scientists now confirm that human activity is changing our climate. On the New York Times Dot Earth blog, science writer Andrew C. Revkin regularly examines efforts to balance human affairs with the planet’s limits.